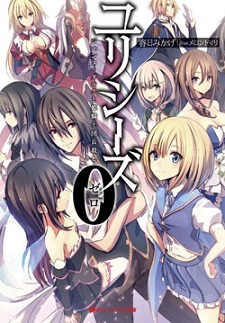 The wraparound band on the short story collection "Ulysses 0: Jehanne Darc to Hime Kishi Danchou Kuroshi" volume of light novel Ulysses: Jehanne Darc to Renkin no Kishi has revealed that an anime adaptation of the series is in progress. The novel is written by Mikage Kasuga with illustrations by Merontomari, and has been published under the Dash x Bunko imprint since August 2015. Shueisha released the third volume in April 2016, and the short story collection on Wednesday. 101 on how to hype up and then completely disappoint the reader within a single sentence of the synopsis. Doesn't seem all that interesting. u know if u dont like this genre u can watch the 30 other seasonal anime that comes out every season right? Oooh it looks likable and I can't wait now. We need a 3-5 year moratorium on bad isekai, harem, and fantasy LNs being adapted into anime. This is just ridiculous. You know what, sometimes I think that Japanese are writing/Adapting to TV's medium more stories using the "Jeanne D'Arc" name than us French. I do like the looks of that one guy though..
> Promo image features a girl in a modern day school girl uniform type clothing. Rather than The Rose of Versailles, it might be more similar to Magi?